The La Thuile dataset consists of 965 site-years of data from over 252 eddy covariance measurement sites, it supercedes the Marconi FLUXNET dataset that was produced in 2000 (with 97 years of data from 38 European and North American sites). 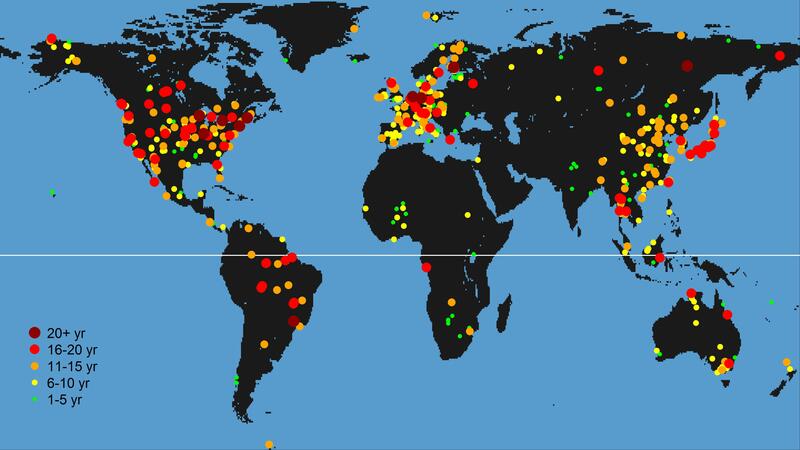 The FLUXNET Synthesis database harmonizes, standardizes and gap-fills the ‘raw’ 30-minute data records of carbon dioxide, water vapour and energy fluxes submitted by members of regional networks from around the world: CarboeuropeIP, AmeriFlux, Fluxnet-Canada, LBA, Asiaflux, Chinaflux, USCCC, Ozflux, Carboafrica, Koflux, NECC, TCOS-Siberia and Afriflux. More information about the FLUXNET project can be found here. The La Thuile Dataset has opened up three versions of dataset including one that is freely available without requiring any prior approvals. The original dataset is the LaThuile dataset which is only available to synthesis teams including at least one data contributor. The ‘Open’ dataset is available for use by any synthesis group after acceptance of a proposal submitted to the steering committee. The policy for this ‘open’ dataset can be found here and the template for submitting a proposal here. This data set consists of site years from PIs who give us permission to designate their datasets with the status of ‘Open’. The third dataset is publicly available free fair-use without requiring a prpoposal. The ‘Free Fair-Use’ policy’ is available. The intent of these datasets is to provide flux data to the broad community of scientists who need flux data to test, parameterize and validate land surface schemes in climate models, dynamic vegetation models, remote sensing algorithms, hydrological models, global carbon cycle models and phenology algorithms. (the meeting kicking off the effort to open the datasets to the larger community was held at Asilomar meeting agenda and pictures) We hope that this data will enable a new “global flux perspective” where the different eddy covariance networks harmonize and share data with the aim to increase the quality of the research and the collaboration. These datasets will be regularly updated with data from new sites. The proposal approval process takes three weeks and is intended to minimize parallel work and maximise synergies between groups and efficiency of the analyses, a “Scientific Moderation Committee” has been created to coordinate the synthesis effort (Dennis Baldocchi, Jiquan Chen, Bev Law, Hank Margolis, Dario Papale, Markus Reichstein and Celso von Randow). At present, there are now more than 110 approved proposals. There are three versions of the La Thuile synthesis dataset: LaThuile, Opened, and Free Fair-Use. The complete set of all site years in the FLUXNET synthesis activity is referred to as theLaThuile Dataset. This version of the dataset is available to data contributors. In order to gain access to the LaThuile Dataset, the synthesis team must include at least one data contributor and have an approved proposal. The Opened Dataset is the subset of the LaThuile Dataset that can also be shared with synthesis teams that do not include any data contributors. To access the LaThuile or the Opened dataset a proposal must be submitted (template available here – Submission instructions available here – choose cancel if asked for authentication). All interested people can submit one or more proposals to the Opened Dataset and teams involving data contributors can submit proposals to the LaThuile Dataset. Proposals typically take three weeks for approval. The authors and contributors listed in the proposal are approved for access to the dataset once the proposal is approved by the Steering Committee. The data can NOT be shared except with approved collaborators. To add a collaborator to a proposal, the coordinator of the proposal must send the CV of the collaborator to the steering committee for approval. Approval typically takes about two weeks. If a collaborator has been approved, they can be given access to the data. This procedure applies to all contributors including data providers joining proposal teams and students in the laboratories of primary authors. The final dataset contains site years that have been designated as accessible to Free Fair-Use Users. In order to access this dataset request a login on the fluxdata.org site. All registered users have unrestricted access to the Free Fair-Use Dataset but they must abide by the fair-use policy. Paper about the BADM protocols by Law etal.